Chicken is used in various salad recipes to make them more filling and mouth-watering. 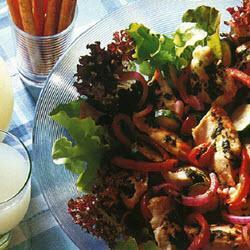 However, New-Style Chicken Salad is different from most of the other chicken salads. The reason which makes this affair unique is the preparation method of chicken and vegetables. Both these ingredients are grilled after marinating with a mixture of zest, lemon juice, oil, basil and pepper – which makes New-Style Chicken Salad truly an appetizing dish to be consumed. If you want to try this unique and tasty salad, then read the steps given below in order to learn the simple recipe of New-Style Chicken Salad. Take chicken breast fillets and cut each of them into 4 slices. Then put these slices of chicken fillets in a shallow dish. Grab another shallow dish and combine onion, cherry tomatoes, zucchini and capsicums. After this take a small bowl and mix zest, lemon juice, oil along with basil and pepper. Then, pour half of this mixture over chicken fillet slices and rest of it over vegetables and toss the ingredients until they get coated. After tossing them, cover both dishes with plastic wrap and put them in the refrigerator for 2 hours on a minimum so these mixtures can marinate. Then take a grill and preheat it. Spread the chicken over it after taking it out from the refrigerator. You have to grill the chicken by turning it just once for about 6 to 8 minutes or until it gets cooked thoroughly. Shift this grilled chicken to a plate, cover it in order to keep it warm. Now it’s the turn of vegetables to be grilled by placing them on the grilling tray. You have to grill the vegetables until they turn brown and soft. During this process turn the vegetables just once and brush twice with the marinade. When the vegetables are done, serve them along with grilled chicken by spreading them over salad leaves.